On 27 December 2012, draft legislation substantially modifying the Belgian Act on the Protection of Economic Competition of 2006 (APEC) was tabled in Parliament. After months of discussions, on 3 April 2013, the Parliament adopted an act inserting a new Chapter IV entitled ‘Protection of Competition’ and a new Chapter V entitled ‘Competition and Price Evolution’ into the Belgian Code of Economic Law (BCEL). On 6 September 2013, the BCEL entered into force. This replaced the previous APEC. the Prosecution Body, tasked with investigative powers under the direction of the General Prosecutor. According to the preparatory work for the BCEL, the Prosecution Body must play the role of an ‘independent filter’ in order to refuse the opening of instructions and to dismiss cases in view of the priority policy and of the available means, or because a complaint is unfounded or time-barred. The Prosecution Body has been granted the power to dismiss a case by adopting a reasoned decision.2 Such a decision is open to appeal before the President of the BCA. Another new feature under the BCEL is the introduction of a settlement procedure. A 10 per cent reduction in the antitrust fine will be offered to undertakings concluding such a settlement with the Prosecution Body. In such cases, the Prosecution Body will be competent to adopt a final decision, which is deemed equivalent to a decision of the Competition College, despite the fact that no appeal can be lodged against such a settlement decision. On 22 June 2015, the Prosecution Body adopted its first settlement decision in the household, body care and hygiene products case, which is further examined in Section II. Another interesting development is the entry into force on 22 June 2017 of a law inserting the action for damages for infringements of the competition law in Title 3 of Book XVII of the BCEL, transposing into Belgian law Directive 2014/104/EU of 26 November 2014 on certain rules governing actions for damages under national law for infringements of the competition law provisions of the Member States and of the European Union. Based on the new provisions inserted in the BCEL, any natural or legal person having suffered harm caused by an infringement of the competition law has the right to obtain full compensation for such harm. These provisions apply to any infringements of Articles 101 and 102 TFEU or of their Belgian counterparts, or of both. If there is a decision by the BCA finding an infringement, such a finding is deemed irrefutably established for follow-on damage proceedings before national courts. resources: the BCA also takes into consideration the amount of resources necessary to start the investigation. On 22 March 2016, the new Leniency Guidelines entered into force.7 They apply to all leniency applications submitted after that date. The most important change introduced by the Guidelines consists of practical rules for leniency applications submitted by individuals. Clarification regarding how these rules are implemented was required, particularly since the option for individuals to obtain immunity for ‘whistle-blowing’ became part of the BCEL in 2013, and in light of potential sanctions against individuals for certain types of competition law infringements. Individuals are always granted full immunity, regardless of where they rank in the order of applications submitted, provided that they meet the other conditions set out in the Guidelines. In addition, the first undertaking can still enjoy full immunity even when an individual has already contacted the BCA. The Guidelines also clarify that individuals may apply for leniency alone or together with the undertaking or association of undertakings for whom they work or used to work. the possibility to obtain a marker. In 2017,9 the Competition Council did not take any fully fledged decision on the basis of Article IV.1 BCEL, which prohibits ‘agreements between undertakings, all decisions by associations of undertakings and all concerted practices, the aim or consequence of which is to prevent, restrict or distort significantly competition in the Belgian market concerned or in a substantial part of that market’. The Prosecution Body, however, took one settlement decision in the area of public tenders. In Compact Station,10 ABB Ltd and its subsidiary ABB SA lodged a leniency application to the Prosecution Body in 2013 in which it revealed its participation in a bid-rigging cartel with four other companies (Siemens, AEG Belgium, Schneider Electric and Sécheron) in the context of a public tender launched by Infrabel, the public company responsible for, and owner of, the Belgian railway network. The public contract at stake concerned a large number of compact stations for traction substations, allowing the conversion of alternating current to direct current, as well as a large number of compact stations for sectioning posts, allowing the insulation of a part of a circuit or a network. When Infrabel launched requests for quotation relating to that public contract, the five companies involved agreed to divide between them the different requests for quotation by offering prices calculated in such a way that each company won that part of the tender previously agreed upon between the bid-rigging parties. According to the Prosecution Body, the contested practices lasted from August 2010 to June 2016. For that infringement, the Prosecution Body imposed fines amounting to €971,000 on Siemens, which benefited from a 50 per cent reduction of the fine for having lodged the second leniency application, to €357,000 on AEG, which was granted a 30 per cent reduction of the fine for having brought the third leniency application, and to €19,000 and €432,000 on Sécheron and Schneider, respectively. Given the fact that the undertakings agreed to settle the case with the Prosecution Body, they were all given an additional 10 per cent reduction of the fine in exchange for recognising the existence of the cartel. It is also interesting to note that four natural persons received full immunity from prosecution based on the leniency notice. It remains to be seen whether Infrabel will make use of the new law provision regarding actions for damages for infringements of the competition law to obtain full compensation for the harm it suffered because of that cartel. One of the major changes under the BCEL is the introduction of the possibility of imposing administrative penalties on individuals for direct involvement in hard-core antitrust infringements (with the exception of abuse of a dominant position). At the time of writing, the BCA has not yet imposed administrative penalties on individuals on that basis. However, these sanctions have caused individuals to consider whether they would, separately or jointly with the undertaking that is their employer, file an application for immunity. As Compact Stations, inter alia, shows, individuals have used this possibility. It is expected that this will be a growing source of information for the BCA. A number of cases are still pending before the Belgian Supreme Court in which the legality of dawn raids carried out by the BCA’s predecessors is being challenged. It is to be expected that rulings in these cases will come out in 2018. If these rulings were to confirm the legality of the dawn raids, the BCA will be in a position to take decisions in these cases. In May 2016, inspections took place of a number of Belgian undertakings operating in the sale of non-prescription products in pharmacies, given the fact that the BCA had information about possible infringements of Article IV.1 BCEL and Article 101 TFEU. In October 2016, the Prosecution Body conducted a dawn raid at an undertaking active in the distribution and sale of infrared cabins to find information about possible infringements of Article IV.1 and IV.2 BCEL and Articles 101 and 102 TFEU. In November 2016, other inspections took place at companies active in the wholesale distribution of pharmaceutical and para-pharmaceutical products to pharmacies in relation to alleged participation in anticompetitive agreements and concerted practices between wholesalers active in Belgium relating to services that they provide to pharmaceutical laboratories on the one hand, and to pharmacies on the other. In May 2017, the BCA conducted a series of inspections for different suspected infringements. On 5 May 2017, inspections took place at the premises of one undertaking that distributes and sells water softeners for an alleged infringement of Article IV.1 BCEL and Article 101 TFEU. Three days later, an undertaking active in the distribution and sale of cooking utensils and wine accessories was searched by the inspectors of the BCA in relation to possible infringements of Article IV.1 BCEL and Article 101 TFEU. Finally, on 29 May 2017, the BCA conducted searches of some manufacturers and wholesalers of tobacco products, again in relation to possible infringements of Article IV.1 BCEL and Article 101 TFEU. 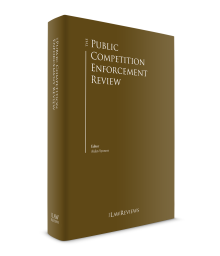 At the time of writing, none of these inspections had led to a decision of the Prosecution Body or of the Competition College. In that regard, it is important to recall that in 2015, the Prosecution Body adopted a settlement decision in relation to an abuse of a dominant position, which was a first in Belgium.11 The European Commission, for example, does not apply the settlement procedure to abuses of a dominant position. requesting and receiving from its dealers commercially sensitive information about competitors active in the sports betting sector. Regarding the first practice, the Prosecution Body recalled that certain behaviour carried out on a market other than that on which an undertaking has a dominant position can be considered as an abuse of a dominant position even when such behaviour actually took place on that linked market and produced its effects on that same market, and not on the market where it is dominant. Applying a fine for the first time since releasing its 2014 fining guidelines, the Prosecution Body imposed a fine of €1.19 million on the National Lottery. In 2017, the Prosecution Body adopted one settlement decision12 finding an abuse of dominance, imposing a fine of €5.5 million on Algist Bruggeman and its mother company, Lesaffre et Co SA, active in the fresh bakers’ yeast sector, for having imposed resale price maintenance; impeded the sales of its main competitors, inter alia, through rebates granted in exchange for the non-inclusion of competitors’ products in its clients’ product range; and tied some clients through the conclusion of artificially long exclusive purchasing agreements. These practices lasted between January 2008 and June 2013. The case was opened ex officio by the Prosecution Body after the latter received an informal complaint and conducted inspections at the premises of Algist Bruggeman and of one of its distributors. The limited number of cases adopted in 2017 can no longer be explained by the uncertainties linked to the legislative reform that took place in 2013 and by the fact that the BCA’s staff members devoted most of their time to that reform. Now that the BCEL has been in force for more than four years (i.e., since 6 September 2013), one could have reasonably expected that more decisions would have been adopted in 2017 by the Competition College, but they were not. The very strict deadlines established by the BCEL to handle a case before the BCA should moreover stimulate the Competition College’s activities. Of course, merger filings occur on a regular basis and consume a lot of the BCA’s time. This may be part of the explanation. The BCA has shown its willingness to adopt settlement decisions. It remains to be seen whether this trend will continue in 2018. Another interesting evolution to watch will be how the entry into force of the 2016 Leniency Guidelines will have an influence on the activities of the BCA and whether more leniency applications will be introduced. Finally, decisions could be expected in the areas where dawn raids took place in 2016 and 2017. According to Article IV.44 BCEL, ‘the President may, on its own initiative or at the request of the minister or of the minister with responsibility according to the sector concerned, carry out or order general or sectoral investigations, if there is serious proof of harming the functioning of the market’. In that regard, he or she may request the assistance of the Prosecution Body. To date, the President of the BCA has not yet used his powers in this area. That being said, the BCA has participated actively in the hotel sector monitoring working group led by the European Commission. For Belgium, 981 hotels were questioned about most favoured nation clauses or equivalent provisions. For the moment, no actions undertaken by the BCA in this area have been made public. The BCA has no competence in the area of state aid. The European Commission is the only authority within the European Union that can approve state aid measures. In 2017, about 10 merger decisions were adopted by the BCA, which cleared the majority of the examined concentrations under the simplified procedure.13 Two cases are of particular significance, as in both cases the Competition College approved the transaction on condition of commitments, which is not a common practice of the BCA. Finally an interesting development concerns the lifting of certain conditions imposed on Kinepolis Group. These conditions were imposed following the merger of two independent movie theatre companies forming Kinepolis in 1997. They required prior approval for any acquisition of another movie theatre even when notification thresholds were not met. The commitments even required Kinepolis to obtain prior approval for internal growth, leading to a raft of closures of movie theatres in order to replace them by others in other commercially more interesting geographic areas and to avoid the prior authorisation process for internal growth. Finally, a number commitments were also given relating to not concluding programming agreements with independent movie theatres, and not concluding exclusivity or priority deals between Kinepolis and its daughter, KFD, which is a movie distribution company. Following earlier attempts to lift the conditions between 2006 and 2010, Kinepolis filed a new request in 2017, resulting in a partial lifting of the conditions: as of 31 May 2019, Kinepolis will be allowed to grow internally without having to apply for prior approval. Belgium has turnover thresholds that are too high when compared with its economy and the average size of companies active in Belgium. A concentration must be notified when two of the undertakings involved in the transaction each have a turnover in Belgium amounting to €40 million. In addition, all the undertakings concerned must have jointly a €100 million turnover in Belgium.16 Of course, when a concentration meets the thresholds for a notification at the EU level, no notification at the national level is required. Exceptions to this rule are the referral provisions contained in Articles 4 and 9 of Regulation 139/2004 on the control of concentrations between undertakings. Article IV.11 BCEL clearly stipulates that in the case of the referral of a transaction to the Belgian level, a new notification must be filed with the Prosecution Body. Accordingly, only a few transactions must in principle be examined by the BCA, since operations implying undertakings that do not meet these thresholds do not have to be notified, whereas transactions implying bigger companies must rather be notified at the European level. In May 2017, the BCA published an evaluation report regarding the notification thresholds for concentrations in Belgium. It concluded that these thresholds are already sufficiently high and should not be raised, and that there is also no need to lower them.17 The Prosecution Body nevertheless proposes that in the event that the notification thresholds would be lowered, this should happen only in relation to certain specific sectors, as this is the case in France, but not in general. In any event, the BCA indicates that a public consultation should be organised should a concrete proposal to modify the notification thresholds be discussed. The volume of significant decisions rendered by the BCA is quite low, despite the fact that it receives a relatively high number of complaints. However, it must be borne in mind that a number of those complaints are unfounded or derisory. As resources are limited, it would be irresponsible of the BCA to start long and unproductive investigations at the taxpayers’ expense in all those cases. Moreover, Belgium is a small country, which means that undertakings that infringe the Belgian competition rules generally also infringe other Member States’ national rules, as well as European competition law. Such practices therefore fall within the competence of the European Commission, or are dealt with by other national competition authorities. It is also worth noting that even at the European level, the number of decisions rendered by the Commission finding an abuse of a dominant position is very low. Moreover, Commission decisions finding infringements of Article 101 TFEU (except for cartel decisions) are close to being non-existent. As rightly indicated in the explanatory memorandum of the proposal for the BCEL, in view of the fact that the European Commission does not take more than eight decisions per year establishing an infringement, it cannot be expected that the Belgian authority conducts more than four investigations a year that result in the discovery of an infringement. Moreover, the BCA focuses on finding cartels, as does the Commission and many other national competition authorities. Part of the reasoning is that cartels are most damaging to consumer welfare. However, another, less encouraging, explanation is that the entire detection system is directed towards cartels (leniency is available only for cartels), and that more difficult analyses (i.e., does an agreement infringe Article 101 TFEU or Article IV.1 BCEL?) are not undertaken because of the lack of resources (legal and economic) and the greater likelihood of the Competition Authority’s decision being overturned on appeal. Developments in 2017, however, seem to indicate that the BCA has now shifted up gears in going after resale price maintenance, and that it will occasionally take on an abuse of a dominant position case. 1 Hendrik Viaene is partner and Delphine Gillet is a senior associate at Stibbe. 2 According to Article IV.42, Section 2 BCEL. 3 Decision No. ABC-2016-I/O-31-AUD of 7 November 2016, case MEDE-I/O-15/0002 – Immoweb, available on the BCA website. 4 According to Article IV.47 BCEL. 5 Available on the BCA website. 6 Available on the BCA website. 7 Available on the BCA website. 8 The BCA has already granted immunity and leniency in a hub-and-spoke cartel case in 2015; See decision No. ABC-2015-I/O-19-AUD of 22 June 2015, case CONC-I/O-06/0038, Hausses coordonnées des prix de vente de produits de parfumerie, d’hygiène et de droguerie, available on the BCA website. 9 As it mainly relates to 2017, the present contribution takes into account developments that occurred up to 31 December 2017. 11 Decision No. BMA-2015/K-28-AUD of 22 September 2015 in cases MEDE-P/K-13/0012 and CONC-P/K-13/0013, Stanleybet Belgium NV/Stanley International Betting Ltd and Sagevas SA/World Football Association SPRL/Samenwerkende Nevenmaatschappij Belgische PMU SCRL, available on the BCA website. 12 Decision No. BMA-2017-I/O-07-AUD of 22 March 2017 in case MEDE-I/0-13/0001, Algist Bruggeman NV, available on the BCA website. the parties to the concentration are engaged in business activities in the same product and geographical market (horizontal relationships) provided that their combined market share is less than 25 per cent. The simplified procedure has the advantage that the prosecutor will render a decision within 15 working days. See the rules adopted by the General Assembly of the Competition Council on 8 June 2007, available on the BCA website. 14 Decision No. ABC-2017-CC-13 of 20 April 2017 in application of Article IV.62 §5 and §6 of the BCEL in case No. CONC-C/C-16/0038, available on the BCA website. 15 Decision No. BMA-2017-C/C-23 of 12 June 2017 in application of Article IV.61 §1, 1° and §2, first limb, 1° of the BCEL in case No. MEDE-C/C-17/0011, available on the BCA website. 17 Available on the BCA website.